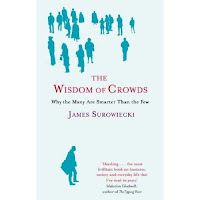 "Dazzling... the most brilliant book on business, society and everyday life that I've read in years" says Malcolm Gladwell, quoted on the front cover of The Wisdom of the Crowds by James Surowiecki. That's a bold quote for the publishers to pop on the front cover. Surowiecki is a business writer for the New Yorker. This is obviously a subject on which he's pondered for years. It's essentially a beefed up version of the adage "two heads are better than one". Except he means lots of heads. Not just two. He's spent a lot of time thinking about how large groups of seemingly non-specialist groups of people can end up making far better decisions, than a smaller bunch of so-called "experts". You just have to allow the crowd to figure it out, and they usually do, really well. We are given examples drawn from history, psychology and academic research to back up his point. He looks at group dynamics believing that the larger the group, the more likely the optimum level for people to make their own rational decisions based on their experience and knowledge will be reached. These, Surowiecki argues, are collectively the right ones. His analysis of the balance of decision making in stock markets makes particularly interesting reading in light of recent economic performance (this book was first published in 2004). This isn't as coherent and straight-forward an argument as you might get in one of Gladwell's books. But Surowiecki has more to prove. So he brings in a more diverse range of studies to back up his argument, often based on rigorous research for added credibility. It made me rethink how I make my best decisions: at work and at home. Recommended. I really want to read this as long as he doesn't try to suggest that anything wise came out of a committee.